“What chips should I collect?” This is one of the most often asked questions by new comers to the hobby. The answer is collect what interests you. This may seem like a useless answer, but it is ultimately the only reasonable answer. Based on the type of chip collector you are, the question might be better asked “What chips are available that help meet my collecting goals”. The only wrong answer is to collect everything, there are easily hundreds of thousands of unique chips that have been created. You must specialize to some degree. Here are some strategies employed by collectors. I have myself have run to far in to many directions. I have experimented with all of collecting areas below (I would have said collecting disciplines, but I clearly have none). This probably the most common collector interest. Vintage, generally implies chips made 1986 and before. Intel microprocessors are the most commonly collected microprocessor. This is due to the brand recognition, historical importance and to the availability of Intel chips. Since Intel was, and is, the leading PC chip maker, the production of the most commonly known vintage chips was relatively high and this keeps the prices of these from going through the roof. Information on Intel chips is generally easy to come by, increasing the interest in these chips. New collectors generally try to collect one type of microprocessor from each of Intel’s technology generations (4-bit, 8-bit, 16-bit, etc.). After that they are couple ways they go. The collecting approaches above are very challenging. First the collector must determine which processors were manufactured. Once the chips are identified, they must go about obtaining them. To complete any of the above could take a lifetime. Some of the more obscure processors will be difficult to obtain. This is a close second in popularity. The collector with this interest will try to collect one processor from every vintage manufacturer, or perhaps one processor from each technology generation, from each manufacturer. Expansion of the sphere of collecting can be done in the same ways as listed above with Intel collecting. This collecting approach will be challenging even in its simplest form. Chip manufacturers may have changed names over time. Small chip manufacturers did not produce many chips. 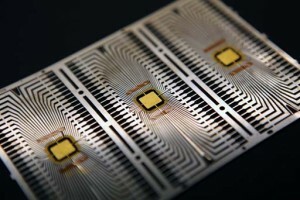 Inventories of relatively unknown chip manufacturers were not kept. This requires more of a commitment to learning about the technology of the chips and the history of the industry. Collectors investigating early chip company’s products often have the feeling, justifiable so, that they plowing new ground and doing original research. This popular collector strategy involves identifying and collecting all the 1st of kind chips. This first strategy can vary from collecting first chip products of different companies, to collecting the first microprocessor of different companies, to collecting 1st chip products of any kind. Some people view logic chips as simply those chips that existed between transistors and microprocessors. Collecting logics chips is great way to truly appreciate technical feat of creating the microprocessor. 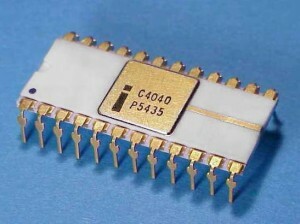 Many microprocessor collectors also collect arithmetic oriented logic chips. Half adders, Adders, and ALU’s are commonly collected. Pre-1970 logic chips are also collected, mostly gold chips. 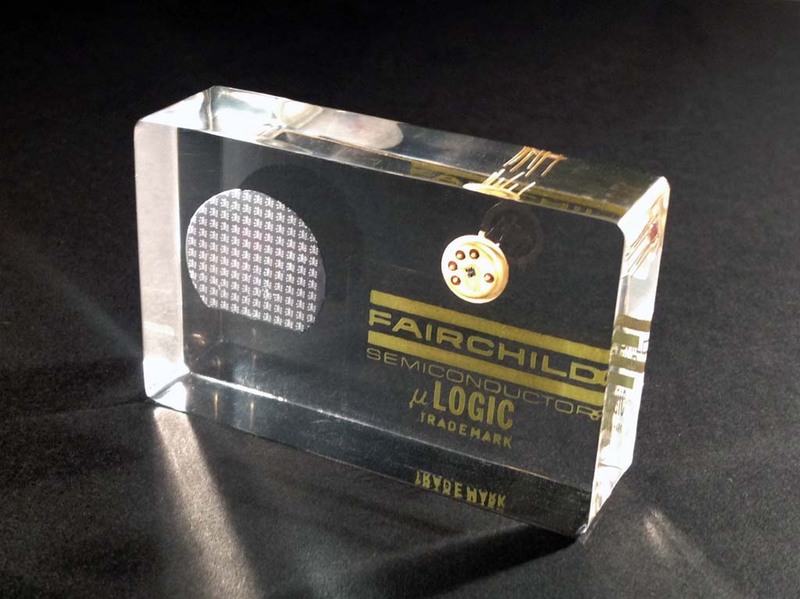 Pre-1965 logic chips, in good condition, are very rare and are highly sought after by chip collectors and transistor collectors. The logic chip collect must plan their collections carefully. The huge number of chips available is mind boggling. Collecting microprocessor memory and supports chips requires more knowledge of the function of microprocessors. Collectors here attempt to collect the chips that were made to help build a computer around the microprocessor. Memory chip collectors focus on the pre-1985 chips. Intel chips are always a favorite, as that was Intel’s original business. Pre-1975 chips are most favored, especially ceramic/gold versions. 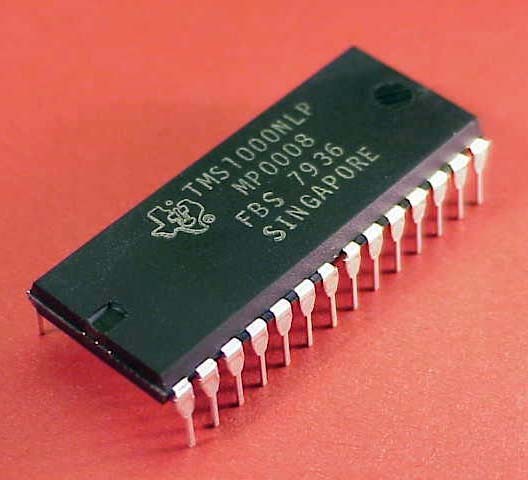 Early EPROMs are especially popular, due to the ability to see the chip inside. The collecting strategy is similar to microprocessors, one from each generation, one from each manufacturer, and so on. Most microprocessor collectors collect a few support chips here and there, but a dedicated support chip collector is very focused. 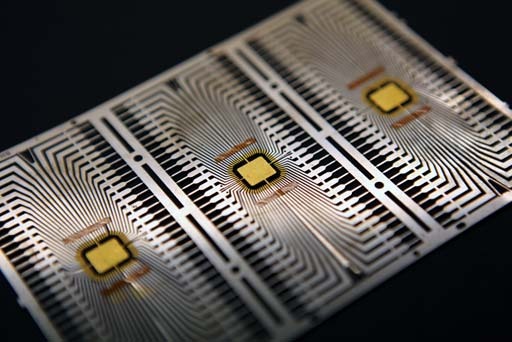 A support chip collector will select a microprocessor, identify the supports made for it, and proceed to acquire a complete set. Support chip collectors will often display their microprocessors surrounded by their supports. This is one of my favorite collecting pursuits. I have over 300 paperweights. Many computer chip manufacturers made paperweights that contained their chips. These were advertising devices. They were given to customers at meetings and conventions to draw interest to their products. These promotional paperweights were made of Lucite, or other clear resin, with the chips and text imbedded in them.The chip specimums were of better than average quality and, of course, never used. Being encased in plastic also protects the chips from any oxidization, and wear and tear. Given that these were not make in large numbers, these chip paperweights offer a “rare” collecting opportunity. Because they were artistically designed to be displayed and sell the company and and its products, they made great display items. This is bit of a crossover hobby because there are people who collect paperweights of all kinds, chip paperweights are just a special type. Most collector like the early white ceramic and gold lid and lead CerDIP’s, but some collectors focus on them exclusively. This is somewhat of a chip-as-art collection. These chips can be shown to just about anyone and get an Ou! or Ah! Many collectors will collect some chips simply for their looks. Many designs have a modern art look to them and some manufacturers went out of their way to make their chips distinctive. 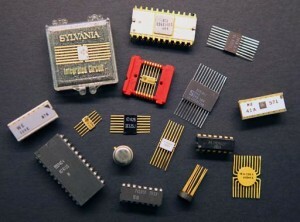 Some collectors like to collect parts that make up a completed chip. The most common is collecting silicon wafers. Many will try to collect all sizes in various conditions from unpolished to finished and tested. Others collect traces, empty packages, and packages with chip in various states of completeness. Related to collecting chip parts, people collect things around chips. It is interesting to collect some of the materials used to make chips, such polysilicon rocks, polysilicon ingots, silicon boules, unpolished wafers, chip testing harness, etc. Without collecting computers, some people collect computer motherboards or single board computers (you can quickly run out of space with this hobby). The United States may have been the starting point of the chip explosion, but it quickly spilled past it’s borders. Chips are made all over the world. Some collectors try to collect chips from every country that packaged, or fab’ed chips. This can be very interesting and certainly helps develop chip collecting contacts in other countries. This is not a trivial effort and requires a lot of research and patience. Even, Intel collector’s have trouble getting chips that were manufactured in Barbados, Mexico, and Hong Kong. Former Soviet Union affiliated countries represent a special collecting interest. During the cold war the Soviet Union acquired western chip technology and developed a series of clones based on Intel, DEC, IBM, and Zilog chips. Many collectors are just becoming aware of these rare chips.